We haven't had a Consumer Report here on Tucker's Tales in quite some time. Either we haven't been enjoying anything enough to share with you all lately, or we have been jipping you all on good tips. I'll go with the former. Either way, I've got something to suggest to all of you. First of all, let me say....R.I.P. to Graeter's Ice Cream in Lexington, Kentucky. I hear it will come back eventually....but I'm just not so sure. I miss the fire out of it though and always enjoyed the search through my cup of black raspberry chip for the large chocolate chips. No one has a better chocolate chip than Graeter's. I miss you babe, come back. Since the passing of Graeter's in Lexington, I have been on the prowl for a new favorite ice cream stop. Turns out that ice cream is so last year. Frozen yogurt is the new craze. "Hey, there's a frozen yogurt place that is even better!" Say what? I had to see for myself. So this afternoon one of my friends forced me to go to a new frozen yogurt joined called "Nati Cream" or "Nati Cakes." To be quite honest, we were a little confused on the name. We knew where to go though. The little frozen yogurt stop is wedged right between Kennedy Bookstore and Fazoli's on Euclid Avenue. The first thing you notice when you walk in is that "Nati Cream" (so says the sign) has a very local feel to it. It's small. It's quaint. It's adorable. It's comfortable. When we walked in the owner immediately welcomed us and came out from behind the counter to help explain to us the process for "making your day a little sweeter" (what a precious little motto). She explained to us the different flavors and offered us a sample of each. The biggest (and best, actually, in my opinion) difference between a place like Nati Cream and Orange Leaf is that Nati Cream has fewer selections for frozen yogurt flavors. That might seem like it should be a negative at first glance, but the flavors are SO MUCH RICHER than any frozen yogurt I have ever tasted. The owner has a "fun and crazy flavor" that she tries out each week to go along with the other 2 regular flavors. This week the "fun and crazy flavor" was red velvet and birthday cake flavor. One word: YUM! Seriously....my friend and I were both completely sold and didn't need to try anything else. We both got the "swirl" option of both flavors together. 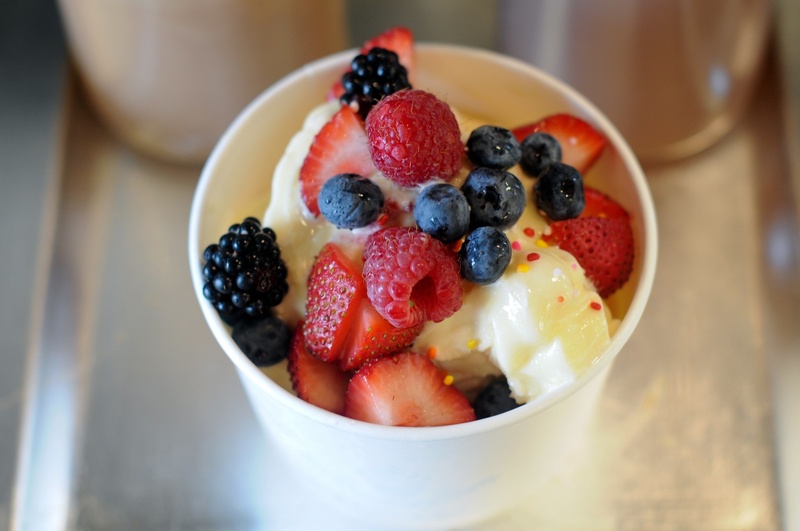 After you get your frozen yogurt in the cup, you make your way over to the toppings bar. Again, not an overwhelming number of selections but a good mix of your standard toppings (chocolate chips, peanuts, cherries) and candy toppings (Reese Cup bites, Oreos, etc) and fruit toppings (strawberries, pineapple, etc). And of course some options such as hot fudge, chocolate and peanut butter could be drizzled on to put the finishing touches on the cup of heaven. Beyond the simple fact that the frozen yogurt tastes delightful, I truly felt like the owner cared about us as customers. She spent time talking with us and I felt like she could be my nextdoor neighbor. That's the kind of "homey" feel my friend and I had after spending some time talking to her. She explained how she runs her business-- and to me the very best part of the business-- a percentage of the proceeds go directly to one of her family members' foundation, the Natalie Wynn Carter Foundation. The foundation was started almost 2 years ago in honor of "Nati Carter," a young child who only spent 23 months on this earth. Her parents wanted to "make something good come out of an unexpected passing of thier daughter and to help her spirit live on through the efforts of the foundation making the lives of children better. The foundation's mission has two main focuses. The first, is to provide spaces for children to play through the building or renovation of playgrounds. This initiaitive was brought to life through the renovation of the Crossroads Christian Church playground and the project was completed in the the fall of 2008 and dedicated on what would have been Nati's 3rd birthday. The second purpose of the foundation is to come along side of other organizations that do great works in the lives of children." How can you not feel good about eating at a place such as that, when it does so much to help the lives of young children? You've got to try it out people! Check out the NatiCakes Facebook Page and even further...go get some of the frozen yogurt. You won't be disappointed AND you will be helping to support a great cause. Ooooh I will definitely have to try it!